Caffeine Content Doesn’t Lie! Does Starbucks Use Cheap Robusta Beans After All? There are two major varieties of the coffee plant: Arabica and robusta. All the best tasting coffee, imbued with rich, subtle flavor, is made from arabica beans. Harsher and more bitter coffees are brewed from robusta beans. The only reason robusta varieties are used at all is that they are hardier plants and cheaper to grow and harvest. Robusta coffee plants survive better than arabica coffee plants because robusta beans produce and contain about twice the amount of caffeine as arabica beans. Because caffeine is a powerful insecticide and anti-microbial agent, the extra caffeine helps protect the robusta coffee plants from pests. A recent Consumer Reports study demonstrated that a 12 ounce cup Starbucks coffee contains nearly twice the caffeine content of an equal size cup of Dunkin’ Donuts coffee. So, it would appear that the coffee beans Starbucks uses have twice the caffeine as the coffee beans Dunkin’ Donuts uses. Now, it is a fact that no arabica beans have nearly twice the caffeine content of any other arabica beans. So, figure it out for yourself. Starbucks claims to use arabica beans. But the evidence of the caffeine content of its coffee puts the truth of that boast into considerable doubt! 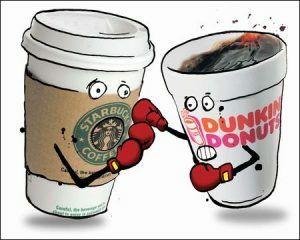 Starbucks' Robusta Coffee vs. Dunkin' Donuts Arabica Coffee? Of course, Dunkin’ Donuts uses a medium roast, which brings out the full flavor of its coffee. Starbucks burns its beans, rendering them so uniformly bitter that it impossible to guess their humble origin by tasting. Is it any wonder that Dunkin’ Donuts consistently tops the list of blind taste tests and Starbucks invariably falls to the bottom? This entry was posted in All News Categories, Coffee & Coffee Brewing. Bookmark the permalink. 50 Responses to Caffeine Content Doesn’t Lie! Does Starbucks Use Cheap Robusta Beans After All? The author if this post is on to something. Compared to a few years ago starbucks coffee is downright awful. It’s bitter, and lacks any kind of flavor. Also another guess is their coffee machines were designed to brew aribaca beans. Now that they are brewing the cheaper stuff the taste and quality is way off. I rarely go to starbucks anymore due to the fact I can’t get a decent cup of coffee. I used to spend about $150 a month. Now it’s more like $15. Hope switching to those crap beans was worth it! The greed in using cheaper Robusta beans is truly astonishing! The cost of serving a cup of coffee includes rent on the property, wages to employees, insurance, etc., etc. The cost of the beans is a relatively small part of the expense. So, using somewhat cheaper beans, beans that are of a far lower quality and have a bitter flavor, saves almost nothing — perhaps a few cents a cup at most! Therefore, even though businesses should try to make as much money as possible, ruining the coffee delivered to increase profits by less than 1% is an astonishing and almost unbelievable depredation and represents complete contempt and disdain for the customers. Starbucks is truly the enemy of coffee drinkers and of all of its customers! It’s not “almost unbelievable”, it’s completely so. You did get one thing correct, the cost of the green beans is a very small percentage of their total costs. Which actually argues against your assumption (your term) that they use robusta beans – why risk the reputation of the company and potentially legal action (they print “100% Arabica” on the bags) to save a very small amount? Figures that you’re a Trumper – liars tend to stick together. So professor, why not step up, buy a bag of Starbucks beans, have the DNA tested by an independent lab, and go down as the guy who exposed Starbucks? You won’t, because it’s a false assumption. I made no “assumption” about Starbucks Robusta beans. I proved that they are Robusta by their super high caffeine content. As far as their motivation, I can only guess that they are doing it not just to hurt their customers but in order to make a few cents more on each cup. But that is speculative. What is certain is that they do use the cheap burned bean! And if you like bitter coffee, keep drinking it! Each to his own taste, as the old lady said when she kissed the cow! And, of course, the empty headed fools who calumniate the greatest President we’ve had since Thomas Jefferson, that is, the honest, heroic President Trump, are the same sort of people who like to swill down Starbucks junk coffee! Cmon professor, in this very thread you say you “assume” robusta based on the totally unscientific claim based on caffeine content. Only later in the thread do you attempt to upgrade that to “proof”. As to Trump and starbucks customers, yes most starbucks customers see him for the incompetent orange buffoon that he is – starbucks customer demographic skews to highly educated. What’s your excuse? See a doctor! Maybe he can cure you of your tasteless preference for burned Robusta beans and your shameful derision of a great and heroic leader, President Donald Trump. Bennett Alan Weinberg – What do you suppose the effect of using twice as much coffee when brewing would do to caffeine levels? 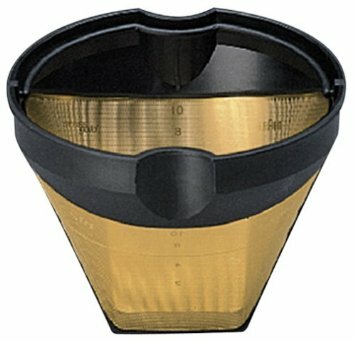 If you ever look at a brew funnel at any Starbucks shop you will notice it is CONSIDERABLY larger than the average brew funnel. They tend to use upwards of 5 oz of coffee to brew a pot. I am guessing that Dunkin and McDonalds are using closer to 2 -2.25 oz of coffee per pot. DO you think this could cause the increase in caffeine content? If you are extracting caffeine from twice as much coffee I think you would have twice as much caffeine. I have not done scientific research on this, so I cannot say, but common sense seems to indicate this is a variable that needs to be considered. Caffeine content does not determine the type of bean, despite that yes, Robusta tends to have higher caffeine. Using caffeine content levels to conclude the type of beans is very poor science. You are mistaken. It has been absolutely proven that, on average, Robusta beans have TWICE the caffeine of Arabica beans. After years of study, I have seen this fact confirmed many times. Yemeni bean are about 1% caffeine, whereas other Arabica coffee have a little more. Robusta beans have about 2% caffeine. Therefore, the amount of caffeine in a cup of coffee is a very good way of determining if Robusta beans or Arabica beans have been used to make it. This is true even though some other factors can somewhat alter the amount of caffeine is actually in a cup of coffee. I’m not living in the US, so my experience might be different from yours. I don’t believe they use robusta. Reasons are: when you look at their beans, they are large and oval, unlike the small and round robusta beans; 100% robusta tastes far worse than Starbucks, Arabica roasted to the same level tastes pretty much the same as Starbucks; Starbucks doesn’t use the espresso machines the world knows, all you have is an automated process and an untrained barista which leaves so much room for error;even the tea you get from Starbucks is more caffeinated than any other tea. The last point means it’s something in the water or the machine, not the beans. Robusta beans are round and small. Arabica beans are oval and large. The beans I see at Starbucks look like Arabic. When you buy their beans and brew them at home, it’s not as strongly caffeinated. So I’m guessing it’s something in their process that makes it more caffeinated. Well, because Starbucks burned beans contain exactly the amount of caffeine that Robusta beans contain, I can only assume that they are, in fact, Robusta beans. I like coffee that doesn’t require gobs of cream, sugar, cinnamon and other things to kill the taste. As an old coffee ad used to say “Ask the man who drinks it black”. A good decently roasted arabica coffee should not be bitter. Starbucks and their imitators are bitter. The theory of over-roasted robusta beans sounds good. I don’t care. I don’t buy bitter coffee. McDonalds and Dunkin Donuts used to serve a mellow columbian arabica. McDonalds replaced it with a bitter brew. We no longer have Dunkin in our area. Stopped going to McDonalds because of the bitter coffee and rude counter help. I have my morning coffee at Whattaburger. Tastes good but not great. It is free to seniors. Can’t beat that! Give those of us who like it mellow coffee. What’s the problem with “cheap” Robusta coffee? Robusta coffee is bitter and tastes pretty bad. And it’s not bad, but you should know that Robusta beans have twice the caffeine of Arabica beans! Robusta beans taste amazing. They have a real coffee taste. Arabica beans taste bland and watery. Of the four main species of coffee beans used for human consumption, Arabica has the least flavor in general while Robusta and Liberica are the most flavorful. This is why coffee snobs like you should stop talking about coffee, you know nothing. Again, your ad hominem cracks are beneath contempt. In any case, all connoisseurs of coffee and almost everyone else recognize the superior flavor of Arabica beans. And it is common knowledge that Robusta beans are only grown for coffee because they are much cheaper than Arabica beans. However, everyone is entitled to his own preferences, as the old lady said when she kissed a cow! I view the ever increasing addiction to be the primary cause of fibromyalgia in the world today.Some 12 million plus have been diagnosed with this in the US from what I read,and the onset and increase in this affliction coincides with the coffee consumption mania.There are coffee shops on virtually every corner and many in between,and they are not there for fun.They are businesses and the only thing that matters is the bottom line-same as every business in the world. Robusta is cheap,and that IS the bottom line. I have told some people who had early symptoms of fibro(tingling and numbness of hands and fingers) of my suspicions,and when they quit the coffee-you guessed it. Try it if you suffer-and tell all about it. Robusta coffee is bitter because it contains a double dose of caffeine. It contains this double dose to help kill microbes and insects that attack the coffee plant. Period. I know about the elevated caffeine content Alan,but not the reason nature made it so-as you say to kill bugs and insects! Of course if you are right-it leads to the gist of my concern.What does excess caffeine mean to human health?It may not kill us directly,but surely there must be some deleterious health effects.I point to fibromyalgia for starters.How many sufferers do you have in the USA now? Caffeine does not cause fibromyalgia, nor does it increase any other widespread health problems. It is probably the safest drug in the world. How do you know it “contains this double does to help kill microbes”? Without any proof, isn’t this just hyperbole? Also, can your prove without a doubt that Starbucks uses robusta? Follow the supply chain and show us. Don’t scream that it’s burnt junk. Show us. I have had their blond coffee which is not burnt. Does it also contain twice the caffeine? A previous employee sees the bags come in from a country and are labeled as Arabica. Is the coffee producer lying, too? I’m not attacking. I’m just asking for some proof behind the statement. The proof is simple: Every time the caffeine content of Starbucks junk coffee is tested, it proves to have at least double the caffeine that Arabica coffee supplies. As it happens, Robusta coffee contains double the amount of caffeine that Arabica coffee contains. Q.E.D. Do you think it could be as simple as Starbucks adding caffeine to the roasting process? Or before or after? Does anyone still care about this issue, or are we all in agreement that good tasting coffee is subjective, a good caffeine boost helps in the morning and sluggish afternoons, and that moderation of anything is usually best? We can agree that, if you prefer bitter, burned Robusta beans, you will like Starbucks. But if you prefer the better quality, richly and subtly flavored Arabica beans, medium roasted as they should be to bring out their flavor, you will hate Starbucks. And Starbucks does not add caffeine,. If they did, they would be required by law to say so. They simply use cheap Robusta beans, which, as I have repeatedly said, contain twice the caffeine of Arabica beans. As someone who used to work in the roastery for Starbucks I can tell you with certainty that they use 100% Arabica beans. It’s all in where the bean comes from and the roasting method. Simple as that. I can take the same beans and roast them different ways and the can both be “medium roasts” but one will have more caffeine than the other. Also since Starbucks has its very own Coffee trading house I would expect that they are able to procure better quality beans than Sunkin ever will be able to. So yeah have a good one. Working in Starbucks does not mean that you have been told the truth about their junk beans. And it wouldn’t really matter if they were Arabica (which they are not), because they are so burned that it is impossible to taste anything except burned bitter flavor. Obviously, you could medium roast any beans, but Starbucks doesn’t do this– it burns its beans all to hell! So, whatever kind of beans they might have been, they are completely ruined by being burned. End of story. I’ve bought whole-bean Starbucks on a few occasions, between bags of my usual Stumptown, and I can tell you there’s a lot of robusta junk in there. You can tell because robusta beans are round, smaller, and have a straight slit in them. Arabica beans are larger, oval-shaped, and have a zig-zag slit. Great information! Thank you very much! 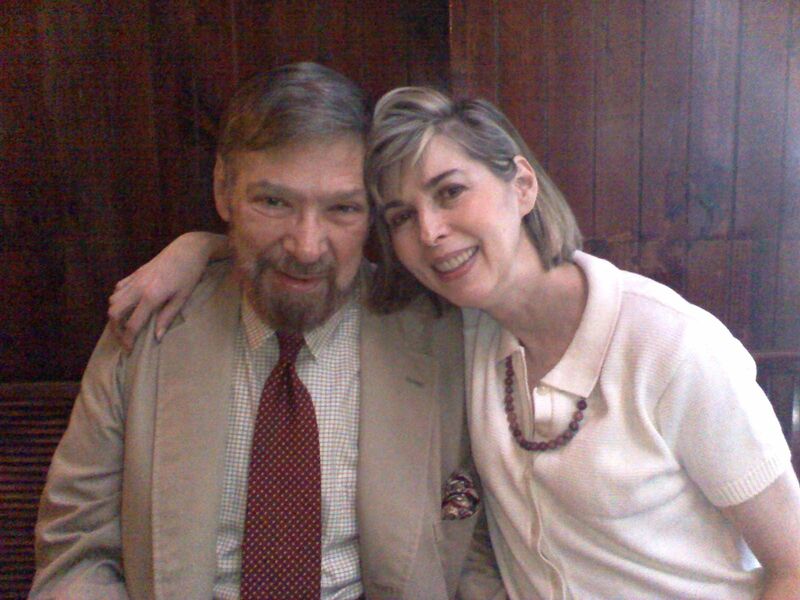 John D’Suhn – don’t waste your breath, this site is the Donald Trump of coffee boards. Facts – who needs them? Thank you very much indeed for your high praise of our web site! It is truly an honor to be compared in any way to our great President Trump! I think there is a variable here. That variable being that a synthetic caffeine maybe being added to the coffee Starbucks is using. As there are no requirements to list ingredients on a coffee bag aside from species and origin. Also they are suing the state of Vermont for the rights to not have to list ingredients. Vermont new GMO bill would make Starbucks list all ingredients in coffee. I think there’s a higher chance that the reason they’re so successful is that they’ve gotten people addicted to a synthetic substance. because it’s quite obvious to me that their coffee tastes really bad. I roast coffee and work in the speciallty industry. I have no experience with robusta, but I do know that it has a significantly higher caffiene ratio. I haven’t had dunkin or Starbucks in years, but as far as I remember the Starbucks cup had a much greater brew strength. A) Brewing method can and does have a great effect on the caffeine content of the resulting drink. B) Caffeine is burnt out of a Coffee the more it is roasted. Therefore if Starbucks coffee is so burnt that would mean it would have far LESS caffeine than Dunkin’ Donuts. If anything; the minimal evidence in this article suggests to me that Dunkin’ Donuts is using Robusta beans and burning them while Starbucks is using Arabica and does not burn them. Especially considering that I actually happen to know for a fact that Starbucks uses 100% Arabica. the caffeine of Arabica coffees. And you are right that long roasting does lower caffeine content, but it does not lower it enough to make Robusta coffee anywhere nearly as low in caffeine as Arabica coffee. Further, whatever you think about Starbucks coffee, it is evident from their wonderful taste that Dunkin’ Donuts uses Arabica beans! (If, in some magical way, Dunkin’ Donuts could have somehow made Robusta beans taste as good as Arabica beans, it should be congratulated! But, of course, this is impossible.) However, if you feel you “know for a fact” that Starbucks uses Arabica beans, then keep living in your dream world. I can’t shake the convictions of someone with your peculiar fantasies. Mr. Bennett Alan Weinberg, with all due respect and off the topic of coffee beans, why do you get so angry and condescending on this forum? It’s just coffee. Some folks like Starbucks, some folks like Dunkin Donuts. Who cares? As long as it tastes good and wakes me up I’m happy regardless of whether it’s Robusta or Arabica beans. I’ve just never seen someone become so condescending over a discussion on coffee. Is it really worth it? You sound a bit muddled. There is nothing “condescending” on my site! If you like Starbucks, I feel sorry for your inability to tell the difference between properly roasted Arabica beans and burned Robusta beans. But, as I’ve repeatedly said, everyone should drink what he likes. But, even so, I think it is my obligation to present a dispassionate and accurate account of what Starbucks coffee really is: burned, inferior beans. I guess that you can’t read or understand everything I have said. I have proven beyond any doubt that Starbucks uses Robusta beans. My post explaining that caffeine content doesn’t like proves this! Robusta beans have TWICE the caffeine of Arabica beans, and Starbucks coffee has twice the caffeine of Arabica coffees, for example the coffees sold my Dunkin Donuts and MacDonalds. There is simply no doubt about this at all — unless you believe that Starbucks is “treating” their coffees with added caffeine!!!!!! Anyway, keep drinking your burned Robusta brews. If you like it and want to pay high prices for it, you should be happy and stop criticizing me for telling the truth…..
Ahh yes, nothing condescending in your replies. Right. You’ve offered no proof of your claim of Starbucks using robusta beans; the caffeine content is not proof and I suspect you know it. Why not have their beans tested by an independent third party – if you’re right, you can be famous as the guy who exposed them for making fraudulent claims. That will sell lots more copies of your book, in even more languages. Until then, you’ve proved nothing beyond your disdain for dark roasted coffees, and that you blame Starbucks for somehow brainwashing the world into liking dark roasts. I have delivered positive proof about Starbucks Robusta beans. I am pleased that you finally recognize that I am not condescending. However, because you seem to be unwilling or unable to understand what I am saying, we will have end this fruitless exchange. Well you’ve kind of proven my point that there is in fact something condescending on your site with this response. 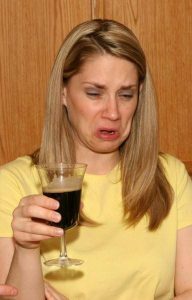 Having said that, my point was anyone should drink whatever coffee they like regardless of whether it’s made from robusta beans or arabica beans. You’re suggesting that folks who like Starbucks have an inability to tell the difference between properly roasted Arabica beans and burned Robusta beans and this is simply false (and frankly arrogant). I drink and enjoy Starbucks yet I’m fully aware that they’re blends are sometimes a little over roasted and that they likely mix in Robusta beans with their Arabica beans. Point being, I’m fully aware of what I’m drinking, I like it just fine and you’re kind of just making yourself look foolish by becoming so offended that people enjoy Starbucks. I also enjoy locally roasted coffees that are 100% Arabica and roasted and brewed to utter perfection, yet sometimes I’m just in the mood for a little Starbucks, and that’s just fine. You just seem to be so offended by Starbucks, regardless of the fact that they do actually make some fine coffees. Mayb they’re not all perfect, but they do have some good ones. So why has Starbucks offended you so badly? If telling accurate truth is “condescending,” then I plead guilty! That is all I ever do on this site. I have studied caffeine for two decades, published the leading books on the subject, which, by the way, have been translated into Italian, Spanish, Japanese, and Malaysian, and so I think I have some standing to talk about caffeine. If you disagree with me, that is your business. However, I rather think that you are being condescending to me! In any case, think and drink what you like. But I do know what I’m talking about! And, by the way, if what you say is true, then you are admitting that Starbucks is fraudulent, because they’ve been claiming for years that their coffee is Arabica! And I always say people should drink what they like. But part of my job is to tell people the truth about what companies are trying to see them. I resent Starbucks because it has virtually destroyed the market for good coffee. Their horrible success selling burnt junk beans has induced other coffee suppliers to copy them. The result is an overwhelming wave of burned junk beans that now replace the good coffee that used to predominate. If you search and search you can still find a few good coffee sources, but it is not easy to do so! I will no longer buy Starbucks coffee, because it is so bitter and burnt-tasting. To me it tastes like burnt plastic. I have two Starbucks gift cards which I refuse to use because I can’t stand the taste of their coffee. Frankly, I don’t understand why Starbucks is still in business. Bravo! I agree 100% — and it’s even stranger that Starbucks terrible example has corrupted almost the entire coffee market! Yes Starbucks does use Robusta beans, or they at least mix them into their coffee beans maybe a ratio of 75/25 or 80/20 with the majority being Robusta. You can tell that they use Robusta beans since pretty much ALL of their coffees taste burnt, or their “light” roast coffee does not taste like a light roast coffee and tastes sour. Robusta beans burn while Arabica beans do not burn nearly as easily at low or standard temperatures for roasting coffee. I never heard that Robusta beans burn more easily, but I can believe that this might be true. Thanks for your contribution!